EXECUTIVE SUMMARY: Israeli Minister of Defense Avigdor Lieberman appears to be accepting the argument that humanitarian gestures towards Hamas will buy quiet. The evidence provided by UN agencies in an effort to advocate for humanitarian gestures ironically proves that there is in fact no correlation between such gestures and a reduction in Hamas violence. Politicians, commentators, diplomats, citizens, international fora, the Knesset, EU institutions, and – above all – Israel’s major media sites endlessly debate Gaza’s alleged humanitarian plight and the virtue of humanitarian gestures as a means to mitigate it. The hope to buy off Hamas with humanitarian gestures is in vain. There is overwhelming evidence that humanitarian gestures do not reduce Hamas-orchestrated violence. Ironically, the best evidence of the futility of the humanitarian argument is to be found in figures and graphs compiled by UN agencies and other pro-Palestinian fora that strenuously champion the humanitarian argument. Let us begin with a long-term analysis of the relationship between humanitarian gestures and violence. According to the humanitarian argument, one should see a reduction of, for example, trucks moving into Gaza in the month or two immediately preceding these bouts. Take a good look at the following two graphs. The first shows the monthly rate of trucks into Gaza; the second shows missile launchings. There is no correlation between the two. 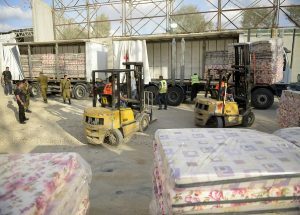 In fact, the number of trucks dramatically increased in 2010 as Israel announced that it would considerably loosen restrictions on incoming produce (it lived up to its word). The number of trucks remained steady up to November 2012. Had the argument held that humanitarian gestures buy quiet, launchings should have decreased in 2010 and stayed low through 2012. The relationship seemed to hold in 2010, but quickly turned negative as the same number of trucks was met by vastly increased missile launchings. This led to the 2012 Operation Pillar of Defense. The findings between the Pillar of Defense campaign and Operation Protective Edge are even more telling. The number of trucks increased. Once again, according to the humanitarian argument, the number of launchings should then have decreased – but as one can clearly see, launchings in the first half of 2014 vastly increased, leading to the most lethal and long-term bout of conflict to date. Hamas does not appear to be swayed in the least by humanitarian gestures. Events of the last four years give no credence to the argument either. It is true that for much of the period, as the number of trucks increased, launchings remained very low. But how can one explain that in 2015, at the beginning of the period, launchings were so few when the number of trucks had decreased from the previous year? Even less does the argument explain why, when the trucks coming in reached their highest level in the first months of 2018, Hamas decided to escalate the violence by launching 1) the “March of Return” at the end of March, which featured violent riots at the security fence every Friday; 2) an uptick in shootings; and 3) massive waves of missile launchings in April. How can this be? As Table 3 shows, more trucks crossed in these months than in the relatively quiet years of 2015 and 2016. 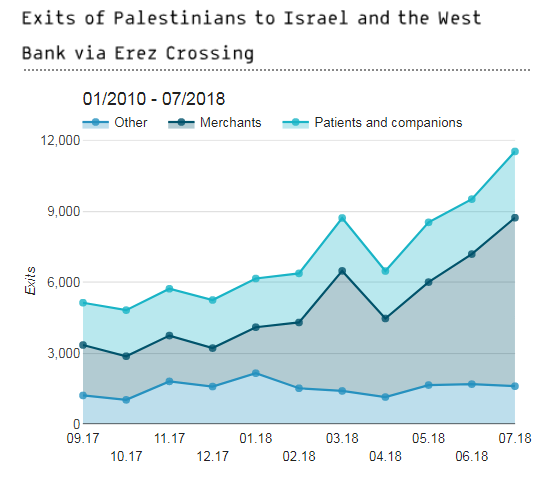 Plotting the exit of Gazans through the Erez checkpoint similarly shows no relationship between humanitarian gestures and the preservation of quiet. The number of Gazans allowed through Erez reached a peak just before Hamas decided to heat up the area with its “March of Return” towards the end of March. 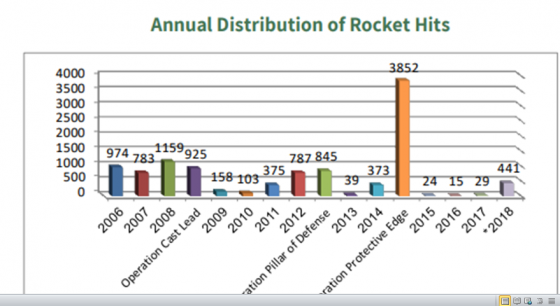 Hamas continued to escalate with missile launchings as Israel increased the number of exits through Erez (See Table 4). Nor does the argument apply to the export of goods. 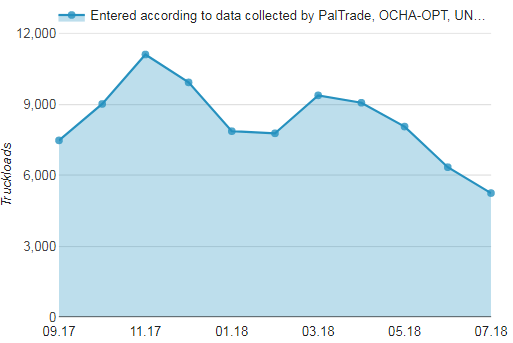 Though there was a slight drop in the number of trucks exiting Gaza in March 2018, their number was vastly higher than in the “peaceful” four last months of 2017. The moral of the story is that violence is generated by political actors for political and geostrategic reasons, not for humanitarian or economic welfare reasons. Hamas calculated first that Israel had moved many of its Iron Domes north to the Golan, rendering Israel’s south more vulnerable; and second that Israel would be restrained from reacting in a massive way to preserve the focus on Iran, especially the oil sanctions that the US will impose on that country in November. It was a good gamble. Hamas achieved both the restoration of the status quo that had prevailed before the March of Return and Israeli acquiescence to Hamas violence during the March – violence that is primarily designed to secure a prisoner deal that will free hundreds in return for the release of two Israeli citizens and the remains of two others. If no progress is made towards a prisoner release on Hamas’s terms, violence will likely continue no matter how much the economic welfare of the inhabitants of Gaza is improved.